Hard to believe it’s blog time again! Isn’t this year just flying over? It’s been a strange month really with one thing and another. I had my first RA flare – you all know I’m open about the RA and generally have niggling aches and bad fatigue – but the flare intensified the swelling and pain, and the fatigue. I upped my painkillers – arranged for a steroid jab and was told by the doc to rest so that’s what I did. Resting is beneficial – it’s not something that comes easily to me either. Since being diagnosed I’ve fought against resting as much as I could – generally not listening to my body until quite recently. It’s probably one of the stages everyone goes through when facing such a disease – maybe denial? I’m not sure really but suffice to say I try and listen now. It still takes a lot for me to admit I need to rest but I do it if I have to. In resting, this has given me opportunity to get my reading mojo back – it’s been awol for some time but I thoroughly enjoyed the book I read while I was off. When I was a kid I used to read about 15-20 books a week – oh for the days when I had that much time on my hands! Now I read slower but tend to speed read when it’s something I have to read rather than want to read. I do read a lot on holiday though. And I’m hoping to get through around 10 novels in my upcoming holiday to Cuba. I’m really excited for this – as is my husband Peter. We’ve never been long haul and the hotel we’re staying at looks like paradise. This holiday is all down to the royalties I’ve received so far – it feels really good knowing my writing is being well received and I’m earning from it! I also spend a good chunk of time on holiday working on my work in progress – which this time, I’m happy to say, is book 5. It doesn’t have a title yet and it’s barely even been started really but I already love it! It’s going to be a corker – the killer is the one of darkest yet and he gives me chills! Always a good sign. 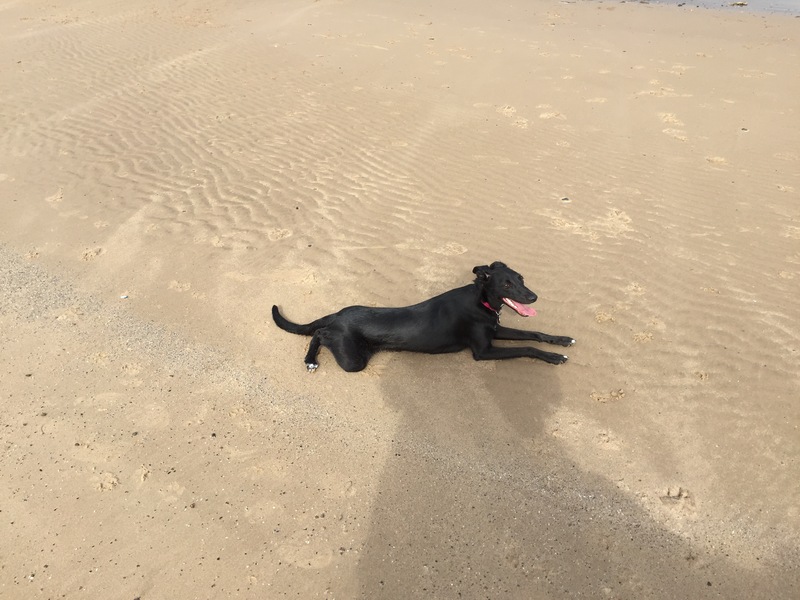 I took the dog for her her visit to the beach a few weeks ago – she loved it! Ran all over with her sister and had a blast. That’s where the pic above came from. She was exhausted after all the running (she ran not me lol) – made for a quiet evening at home. I’ve got a couple of events coming up next week – Thursday I’m part of the Femme Fatale Panel of Sunderland lit fest and am appearing at houghton library with the lovely Sheila Quigley, Danielle Ramsay and Eileen Wharton – will be a good one! And on Saturday it’s the official launch party for I’ve Been Watching You and Time to Play at Sunderland Waterstones from 1pm! Exciting! This entry was posted in Blog Posts on October 9, 2016 by Kerryrichardson77.